As the holidays approach, we at e23 start having a preternatural need to generate lists. However, rather than enumerating lords a-leaping or ladies dancing, we thought we'd ask authors William H. Stoddard and Matt Riggsby for a dozen reasons why two recently released GURPS Locations supplements -- Worminghall and Hellsgate -- would make great (if fictional) places to visit for Christmas. Twelve demons plotting -- No matter who's the most powerful member of Hellsgate's 13-member ruling cabal, the other 12 members are certainly working against him, so there's never a dull moment. Eleven thousand living -- Most of Hellsgate's residents are demons or dead souls made flesh, but a sizable minority are mortals of various kinds; you can be one of them. Ten characters statting -- Hellsgate has time-saving complete GURPS character write-ups for 10 sample residents of the city, from members of the ruling cabal to resident lost souls to long-term visitors from outside. Nine wizards' grimoires -- Meanwhile, at Worminghall, Robin Godwin is ready to sell grimoires and books of lore, or rent them out for copying . . . or hire well-mannered scholars to locate and purchase new ones! Eight barmaids pouring -- There are many taverns in Worminghall (and outside the gates), each with a sign, a tavernkeeper, and a distinctive clientele, to give students and adventurers places to drink, debate, and meet people. Seven Goliards singing -- Secular students of magic (and other subjects) -- or Goliards -- have plenty of time to get into trouble. Locations: Worminghall describes opportunities for adventure, from meeting beggars in the streets to being recruited for the Royal Wizardry. Six traps a-trapping -- Locations: Hellsgate provides traps and curses found protecting demonic lairs and possessions, which can be used directly or as inspiration for your own. FIVE ADVENTURE SEEEEEEEDS! Use them to plug Hellsgate into many fantastic campaigns. 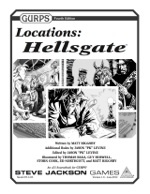 Four genres crossing -- Locations: Hellsgate has advice on using the city with other GURPS sourcebooks, with particular advice for Dungeon Fantasy, Espionage, Martial Arts, and Thaumatology. Three Manastones -- Pay a visit to the Enigma Shop, Worminghall's dealer in magical supplies, to take advantage of the newly invented Manastone enchantment that can charge a gemstone with magical power. Two secret signs -- Locations: Worminghall details a distinctive medieval style of magic, known as Image Magic, with its own variant of Symbol Drawing to aid spell casting. And a magical facul-ty! -- Where do wizards learn their magic? In England in 1300, many of them come to Worminghall! 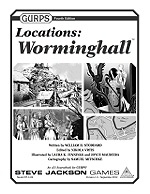 Locations: Worminghall describes a university town where magically gifted young men can study magic and get in trouble. So whether you want to add Hellsgate's ready-to-use descent into hell to an existing epic fantasy game or you'd prefer to curl up with a good spellbook at Worminghall's inviting campus, you're sure to discover that location is everything at e23. Enjoy your visit!